The U.S. Copyright Office issued an interim rule for comment that lays out an intricate and well thought out approach to the Register’s role in designating the Mechanical Licensing Collective and the Digital Licensee Coordinator under Title I of the Music Modernization Act. Consistent with the MLC’s role as a quasi-governmental organization (or quasi-private, depending on how you look at it), the interim rule confirms that “directors of the MLC are inferior officers under the Appointments Clause of the Constitution [,] that the Librarian of Congress must approve each subsequent selection of a new director…. [and] that the Register work with the MLC, once it has been designated to ensure that the Librarian retains the ultimate authority to appoint and remove all directors.” Presumably, state corporate laws governing the formation of the MLC will give way to this requirement. The Librarian’s ability to can directors should help assuage some of the concerns about the powers of the MLC and is, of course, entirely consistent with the powers of the MLC as a quasi-governmental organization. Information regarding whether and how the proposed MLC may apply unclaimed accrued royalties on an interim basis to defray operating costs, as well as any accompanying plans for future reimbursement of such royalties from future collections of the administrative assessment, including relevant legal considerations and guidelines in the event the proposed MLC does intend to apply unclaimed accrued royalties. All in all, the Copyright Office should be commended for putting together a comprehensive and even-handed “job description” for the MLC and the DLC in keeping with the Office’s statutory role in getting this quasi-governmental organization up and running. 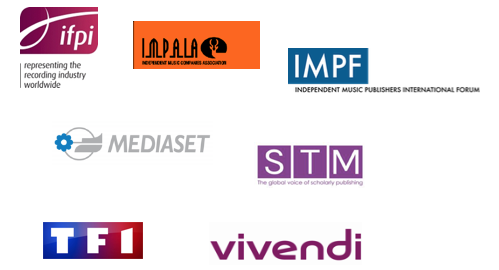 We are writing to you as a group of organisations representing European authors, composers, songwriters, featured artists, picture agencies, book publishers, academic publishers, audiovisual producers and broadcasters, independent and major music producers and publishers, and news and media companies. We have reviewed the European Commission text/non-papers on article 13 and we have serious concerns about the direction of travel. 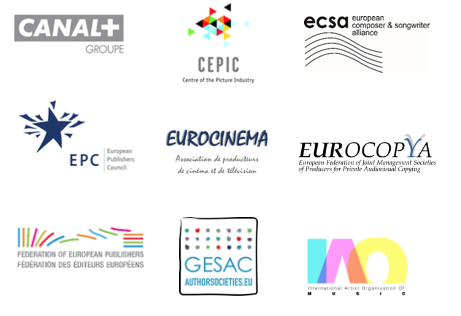 As we reach the very final stages of this process, and negotiators seek to finalise a compromise text, we urge you to remember that the overall aim of the original European Commission proposal was to correct the distortion of the digital market place caused by User Upload Content (UUC) services, which enable users to upload content onto their sites and then profit from the availability of creative content without returning fair revenues to rightsholders, who create and invest in such content. The fundamental elements of a solution to the Value Gap/Transfer of Value remain, as acknowledged by all three institutions in their adopted texts, to clarify that UUC services now defined as Online Content Sharing Service Providers (“OCSSP”) are liable for communication to the public and/or making available to the public when protected works are made available and that they are not eligible for the liability privilege in Article 14 of the E-Commerce Directive as far as copyright is concerned. We continue to believe that only a solution that stays within these principles meaningfully addresses the Value Gap/Transfer of Value. 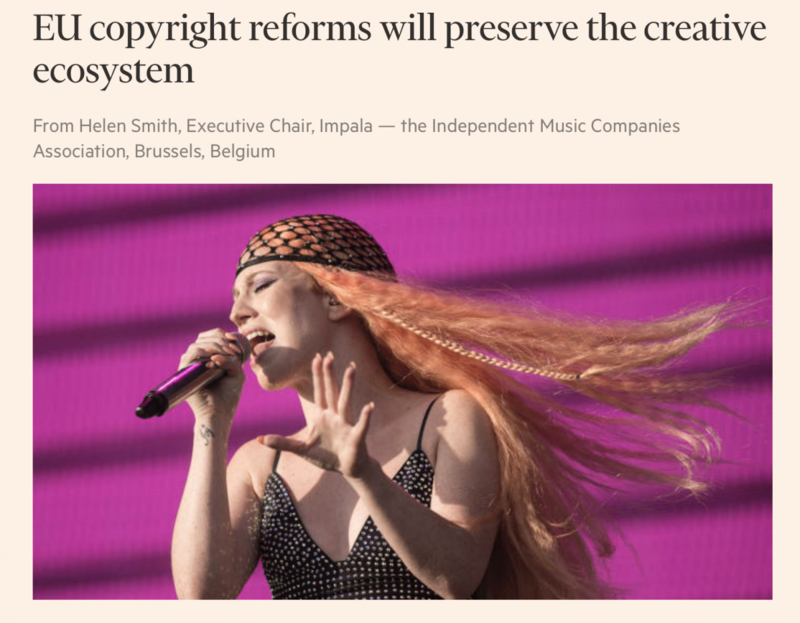 Moreover, licensing needs to be encouraged where the rightsholders are willing to do so but at the same time not be forced upon rightsholders. Therefore, proposals that deviate from the adopted positions of the three institutions should be dismissed. Unfortunately, for a number of reasons, the text now put forward by the European Commission would need fundamental changes to achieve the Directive’s aim to correct the Value Gap/ Transfer of Value. For example, solutions that seek to qualify or mitigate the liability of Online Content Sharing Service Providers should be considered with an abundance of caution to avoid the final proposal leaving rightsholders in a worse position than they are in now. Any “mitigation measures”, should they be offered to OCSSPs, must therefore be clearly formulated and conditional on OCSSPs taking robust action to ensure the unavailability of works or other subject matter on their services. To that end, while it may be appropriate for rightsholders or their representatives to give services access to reasonably necessary identifying information concerning unauthorised works or other subject matter, unclear or open-ended provisions potentially obliging rightsholders to play the main role in preventing unauthorised uses of their works fail to provide the necessary legal certainty and therefore fail to provide a meaningful solution to the Value Gap/ Transfer of Value. Furthermore, any proposal whereby services can effectively choose the level of diligence which will shield them against liability would perpetuate the Value Gap/ Transfer of Value and wholly undermine this crucial draft legislation. We trust that you will take this into consideration when discussing the draft Directive. We’ve said for years that Google shills use a variety of dodges to create the impression of grass roots support among legislatures–when it really isn’t there. We think this because all of the snakes in the grass roots seem to be online, so rarely offline that it may as well be never. One of the big dodges is that the shilleries have autodialing tools that allow anyone to call a number and be connected to “their” Member of Parliament, Senator, Representative. That way the location of the person making the call is masked from the person receiving the call. All you need to know is a postal code in the member’s district, state or country and the dialer will connect you. We saw this entire saga play out in Europe over Article 13 where millions of phone calls and emails were lobbed at the Members of the European Parliament, yet less than 1,000 people showed up to protest across all of Europe. Article 13 sailed through its vote as Members of the European Parliament voted down the Google version of the bill–emphatically. Boaty demonstrates perfectly the entire scam, and guess what–it works both from Europe to the States and from the States to Europe. And frankly, probably from anywhere to anywhere. Well…just one thing to say to Mr. McBoatface: Alba gu bràth, laddybuck.